ERIC CLIFFORD with niece Grace Payne in Santa’s sleigh at the Wilshire Rotary lot on Larchmont Boulevard last year. Fresh-cut evergreens are back and for sale in the neighborhood, thanks to the Wilshire Rotary Club tree lot at 568 N. Larchmont Blvd. 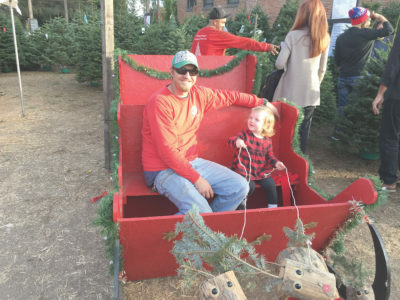 Customers will find Noble, Nordmann and Douglas firs, according to tree lot organizer Wendy Clifford, who explained that the supplies are delivered fresh each week from a farm in Oregon. However, Clifford warns that “there really is a tree shortage” this year. She spent last month working with multiple growers just to find enough high-quality trees for the holiday season. In its 12th year on Larchmong Boulevard, the tree lot is a holiday favorite for families in the community. The lot will host a special fundraising event on Sat., Dec. 15 from 11 a.m. to 2 p.m. A Salvation Army bell-ringer will be on-site collecting donations in a competition between Wilshire Rotary and the DTLA’s Lions Club to raise the most money. A youth mariachi band will provide entertainment, and refreshments will be served. Community members are invited to participate in the fun while picking out a tree. Proceeds benefit the Wilshire Rotary Foundation in support of local community service projects. The tree lot will be open seven days a week from 9 a.m. to 9 p.m. until Sun., Dec. 23. Delivery is available for a fee. Visit wilshirerotary.org or facebook.com/wilshirerotary or call 323-464-1935. « Prado, after 28 years, closes on Blvd. ; Vive Le Parisien!